The Experienced Travelers promised to visit more museums and fewer cafés in an effort to elevate the intellectual tenor of our Paris visits. 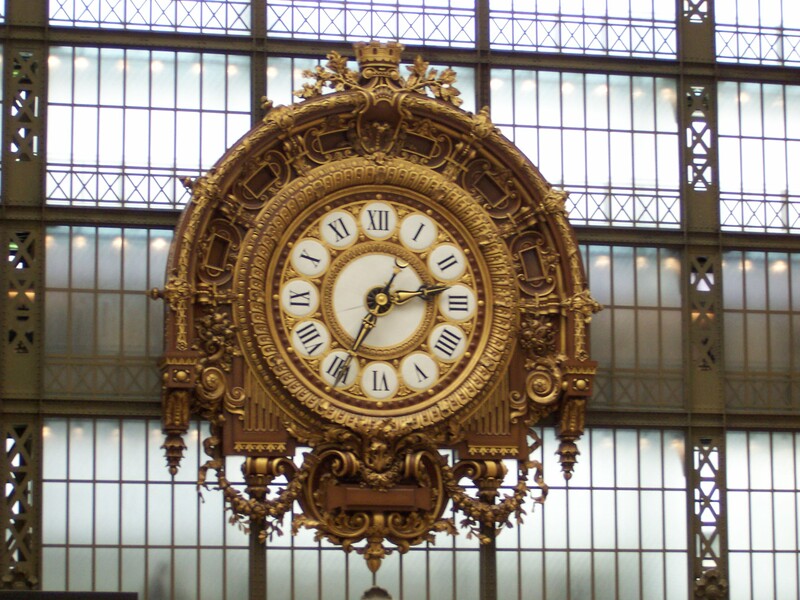 We kept our word, and spent time at the exquisite Musée D’Orsay. The shopping commenced before we crossed the threshold. Imagine what will happen when Christine and Nurse find the gift shop (gift shops are the shoppers reward for an erudite afternoon at the museum) Photo by Barbara. Opened in 1986, the “M’O” houses art created between 1848 and 1914. 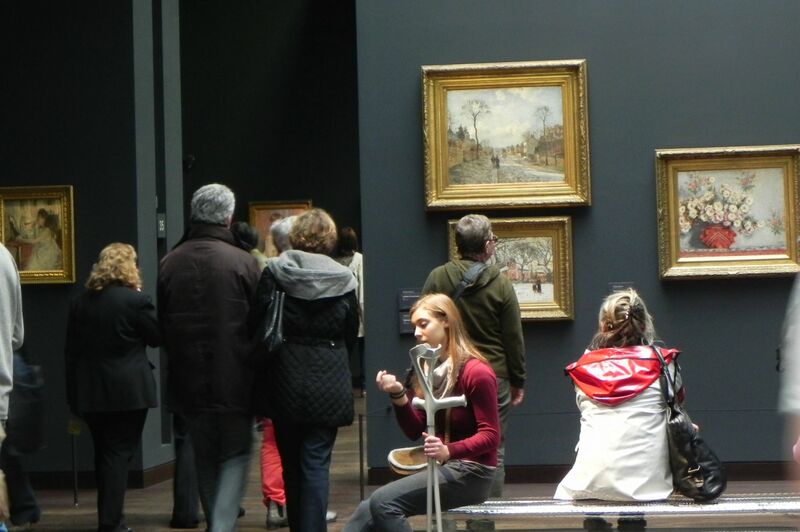 If we paid attention in our high school art appreciation class, we know this means the museum holds an immensely popular Impressionist collection. Popular is an understatement. The entry queue is often long, and we have two hints; buy your ticket online ahead of time, and consider visiting on Thursday evenings when the M’O is open till 9pm and everyone else is queued up waiting for a table at the Violon d’Ingres. Nurse’s hotwheels careened us past the waiting crowds and through Security. Here’s good news for people with limited mobility. You can cut the line! Nurse was using “hotwheels” because of her bad knee, and the very determined Security forces ushered us past the waiting throng. 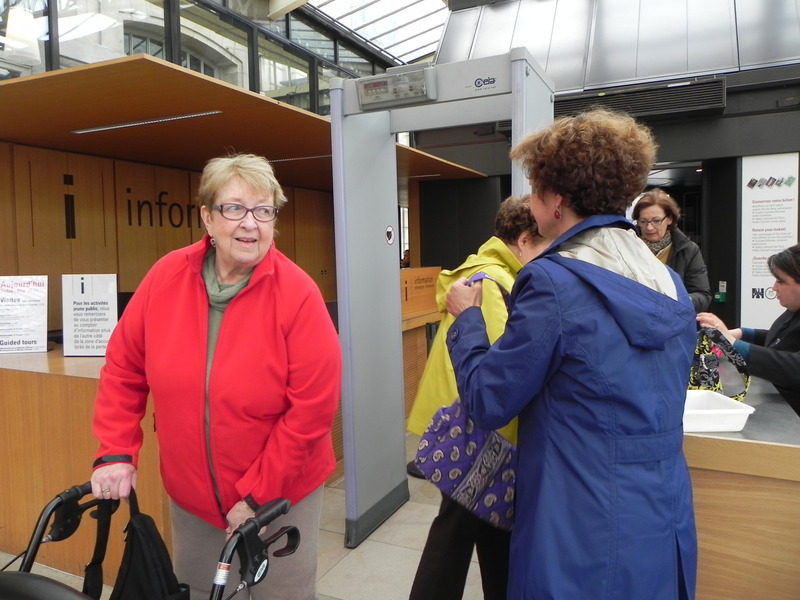 Better yet, we were able to borrow a wheelchair – after the typical miasma of French bureaucracy and paperwork. This convenience got complicated because the M’O is riddled with stairs. So we toured the back hallways and secret doorways, and maneuvered Nurse into elevators the size of linen closets. The Impressionist painters were mocked and derided by the critics. After years of rejection by the prestigious Salon de Paris they brought their work to the public at the rival Salon des Refusés, where they were mocked and derided by the public. But it was worth it. Given the ferocity of the crowds in the galleries, you would think they were showing van Gogh’s ear instead of a self-portrait. 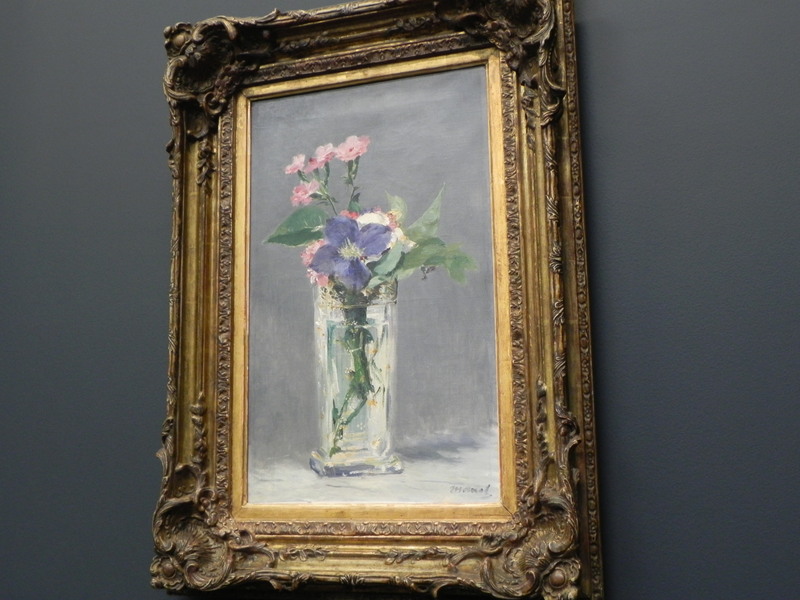 The Renoirs, Manets, Monets, Gauguins and Toulouse-Lautrecs were stunning. So stunning that I wanted to remember them forever by taking “no flash” photos. I could almost taste the heavy brushstrokes on this Monet still life. Suddenly, like the charge of Napoleon’s troops, the uniformed security contingent rose as one, to smote me and my camera. The management of the M’O prefer that I remember the Impressionists forever by purchasing lovely postcards and souvenir drinks coasters in their gift shop. Thankfully I had Nurse riding shotgun in the wheelchair which parted the crowd for a timely retreat to the linen-closet elevator. 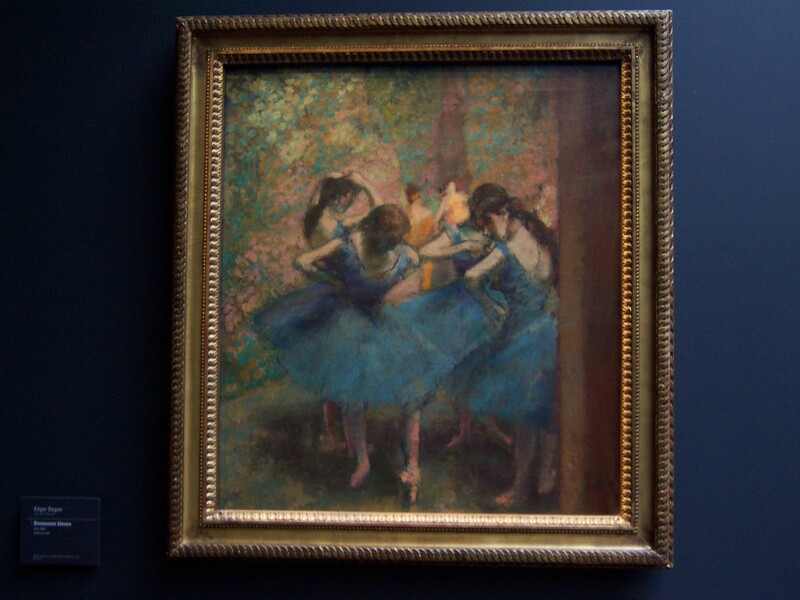 An illegally-got Degas. Barbara and Chris are deeply sorry for this photo and apologize to the management of the M’O for their transgression. We were four intellectually curious women experiencing some of the greatest art on earth. So its embarrassing that we were overheard saying “oh, those colors would work for the bathroom” and “how would those Cathedral at Rouens go along the stairs?”. This happens every time we visit a museum. Maybe that’s why we gravitate to cafés. It’s time to get rid of HGTV and Martha Stewart Living magazine. Will it go over the fireplace? So wheeling through the secret passages and “no entry” doorways we went, emerging each time into a room of extraordinary artwork, but never the room we were trying to find. But no matter. We came away with strong impressions from Mary Cassatts tender images of mother and child, the bleak hopelessness of Degas’ Absinthe drinker and appreciating that Berthe Morisot held her own with the boys at a time when it just wasn’t done. Another Monet. Barbara and Christine promise to make a YouTube video of their apology to the M’O authorities. If the ubiquitous Impressionism calendars make you weary of these French masters, a visit to the M’O will remind you that their use of light, their style and their appreciation for nature and simplicity was revolutionary and wonderful. 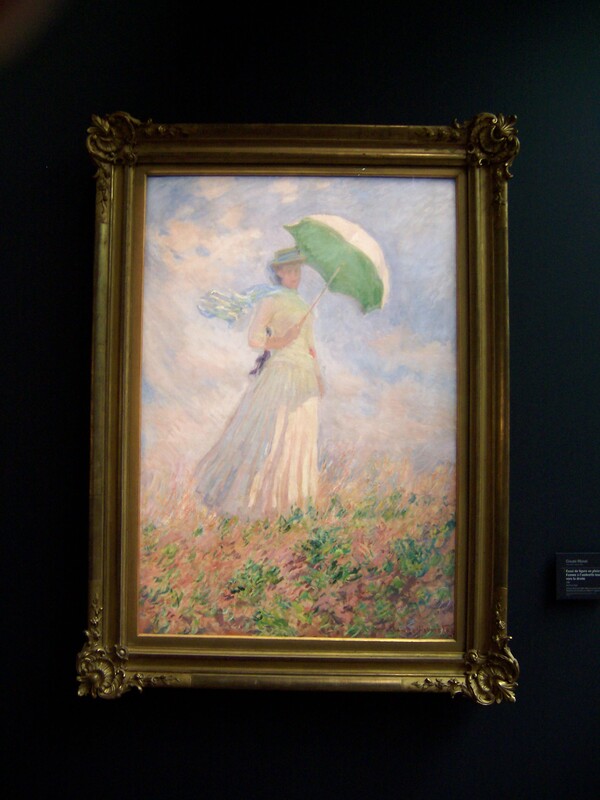 The Impressionists broke the rules of academic painting by depicting day-to-day life, painting outside in nature and painting outside the lines, if you will. So why can’t the ETs be rule-breakers and take no-flash photos or discuss home decor when they should be debating brushstrokes and chiaroscuro? We held our own Salon des Refusés later that afternoon at the Café Central and it was a huge success. 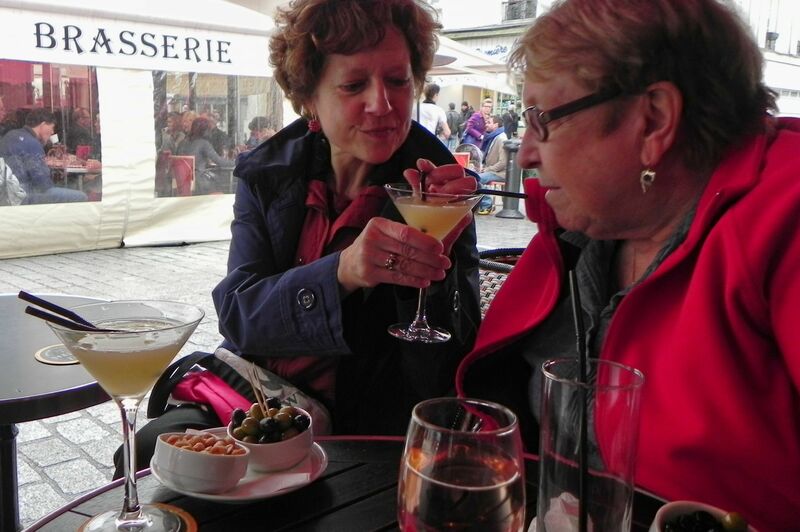 Nurse will not “refuse” a martini no matter what the social and artistic convention might be! 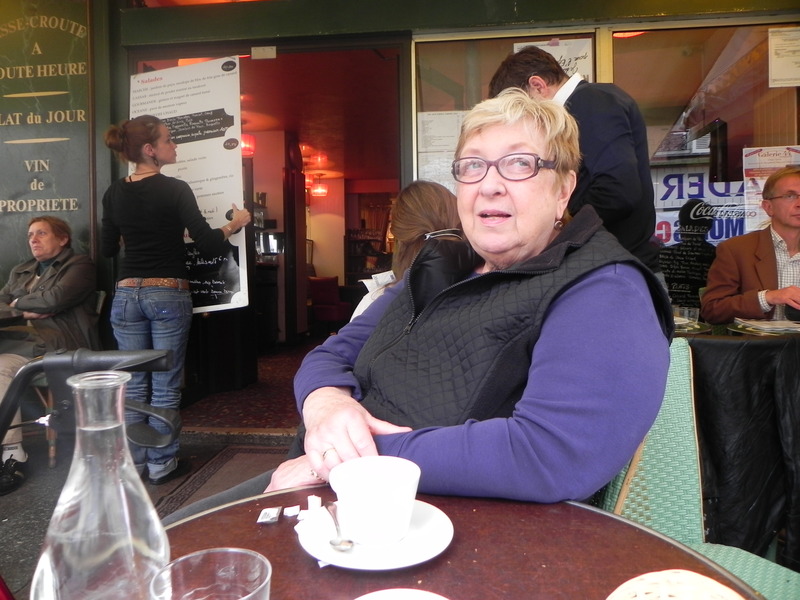 The Experienced Travelers slip into comfy shoes to continue our tour of Paris neighborhoods. All aboard the Batobus to visit the left bank’s elegant, aristocratic 7th. 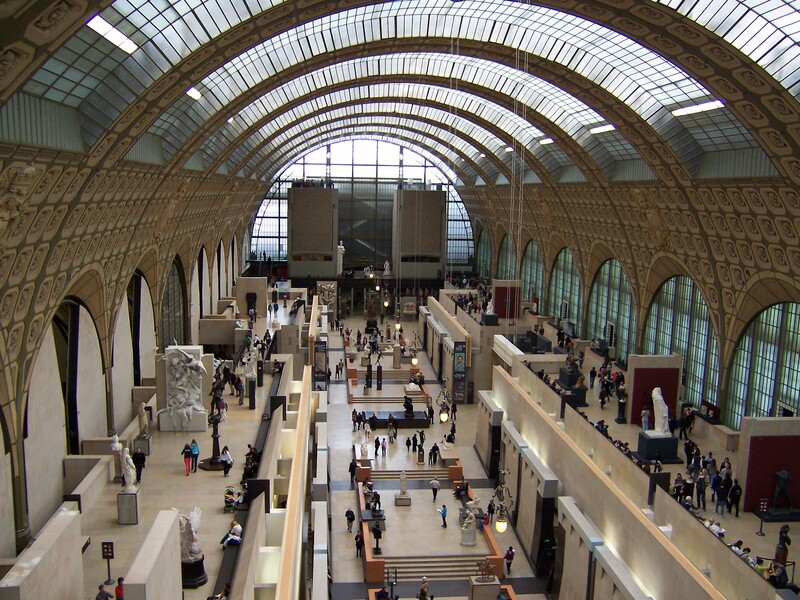 The 7th arrondissement is bounded by the Eiffel Tower and the Musée d’Orsay, with the Seine along it’s curved spine. There is real life here in the 7th, which is well-served by bus and metro. It’s an oasis of normalcy when the Euro-mall atmosphere of the Champs-Élysées makes you long for the madness to cease. Hotels in the 7th run the gamut from budget accommodations to more luxurious digs, with many in the mid-range. We like the Hotel Muguet, where rooms range from 115 – 180 euros. (we must do a write-up on this ET favorite). Apartment rentals are numerous and Paris Perfect has many flats in the area. 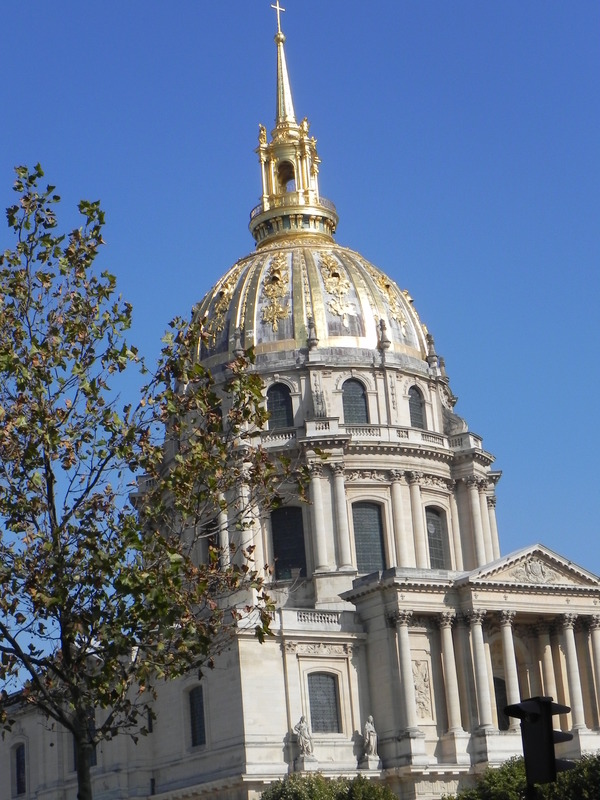 The brilliant gold dome of the Hôtel des Invalides is a hallmark of the 7th. In addition to Napoleon, it has a fine military museum. If you visit and locate Napoleon's stuffed dog, please write us immediately with details. What’s Nearby: Eiffel Tower, the Hôtel des Invalides, Place de la Concorde, Le Bon Marché department store and la Grande Épicerie, the Musées Rodin, d’Orsay and Louvre, UNESCO, the École Militaire, Gare Montparnasse, the Paris Sewer Museum and shopping at Sèvres-Babylone. So let’s have a look around. 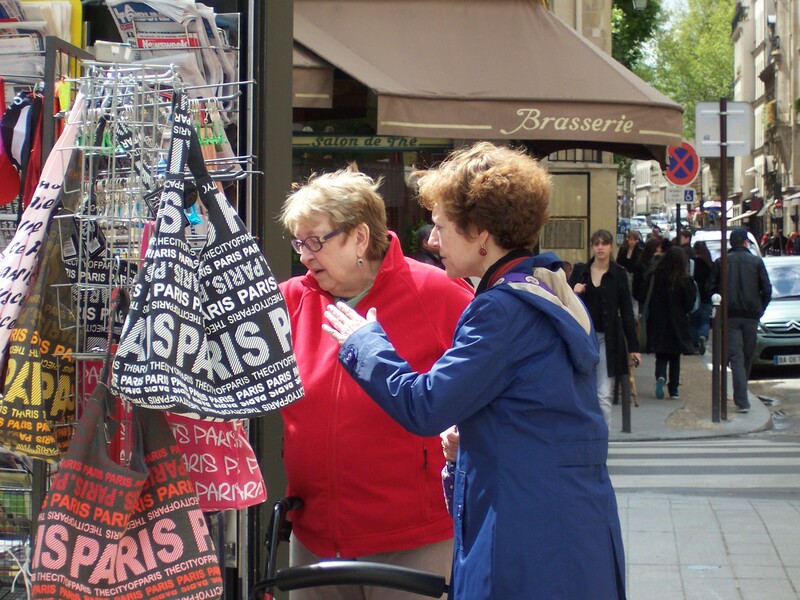 Near the edge of the 6th at Place Saint-Germain is the Sèvres-Babylone shopping mecca. This is a welcome alternative to the crazy crowds at the Galeries Lafayette and Printemps. 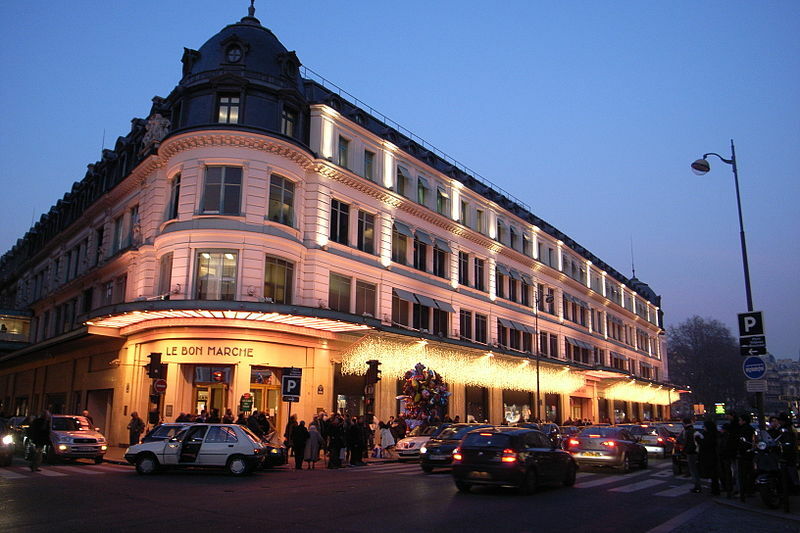 Scores of boutiques and specialty shops hover like flying buttresses around the legendary Le Bon Marché department store and it’s enormous gourmet specialty store, la Grande Épicerie. One-stop shopping, dear Readership! Along the Seine, the 7th is a nerve center of French government and foreign affairs (in a manner of speaking). Dominated by the forbidding walls of embassies and ministries, the Assemblée Nationale and the Prime Minister’s Hôtel Matignon, it’s a sea of suits, smartphones and sunglasses. If you want to confer with the political elite, go at noontime when they’re busy legislating the Fifth Republic over lunch. The ETs don’t bother them much and they reciprocate by granting us tourist visas and dispensation from the V.A.T. Cafés, food stores and restaurants on the rue Cler. You won't leave hungry! 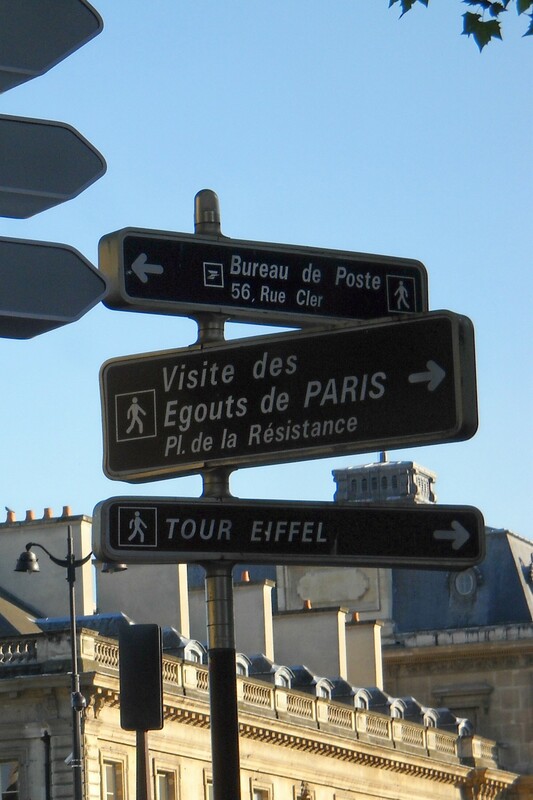 Come with us now to the ET Paris power base – our center of operations near the rue Cler, where we habitually stay. 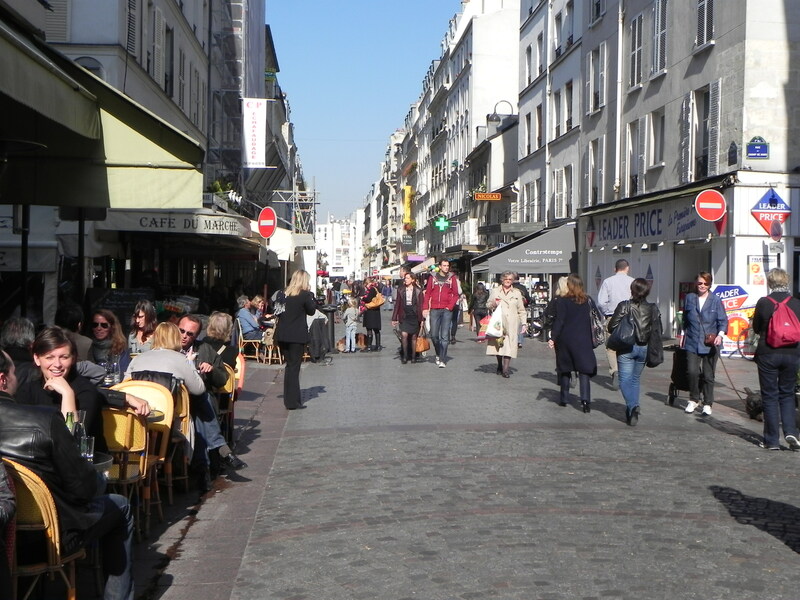 Within walking distance to Napoleon’s tomb (and stuffed dog) in the Hôtel des Invalides or the Eiffel Tower, this neighborhood has a comfortable pace and the convenience of food stores, groceries, local cafés, restaurants and shops on our doorstep. The ETs profess complete loyalty to our preferred cheese and baguette ladies, Monsieur charcuterie, the mean fish man and the hearty smoking guys at the fruit-and-veg. Does anyone have a knife? 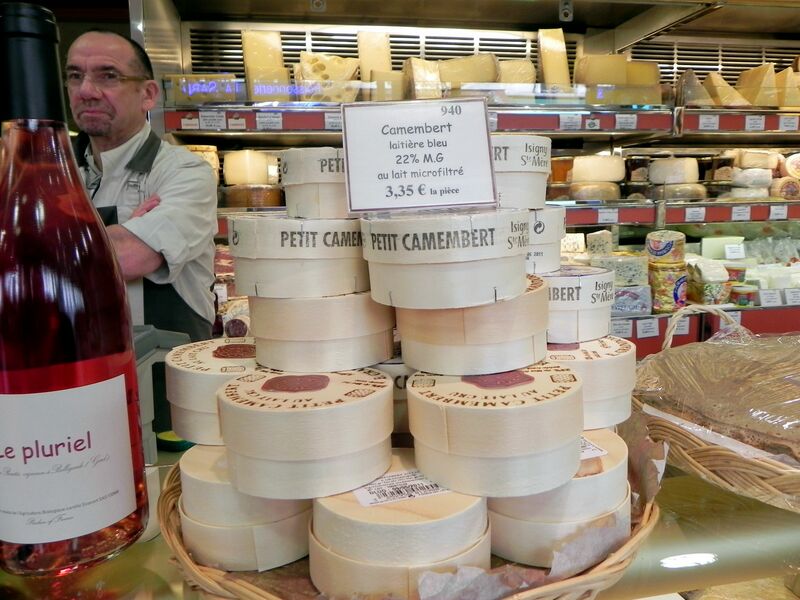 Cheese and other goodies in the rue Cler. This is *not* the mean fish man. We like having the post office on the corner, where we buy the “whatever fits in this box can be shipped for one price” mailers. We’ve used them twice, and our treasures arrived the following week – in great shape. Dinnertime shopping near the Place de l'Ecole Militaire. 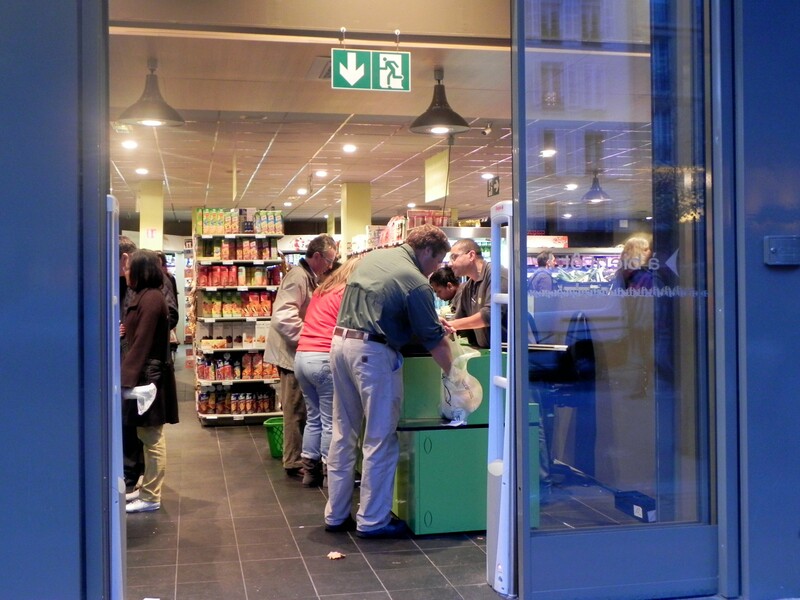 Grab an inexpensive alfresco meal at the numerous grocery stores or the rue Cler market. If you want to dine out, try Christian Constant’s trio of restaurants on the rue Saint-Dominique, or our favourite Le Florimond. 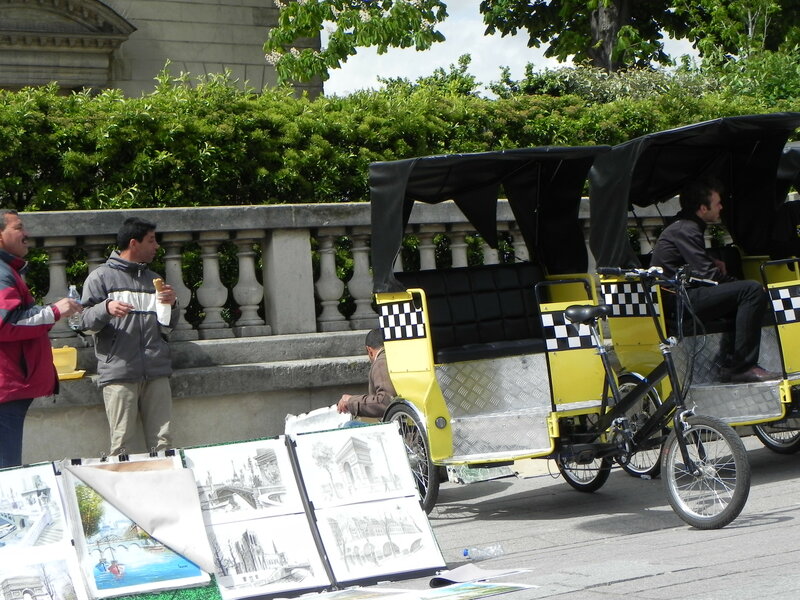 For a quick lunch, there’s the Café du Marché or Café Central where we had the best burger on earth. Enjoy an affordable full breakfast at Le Petit Cler which has the largest café au lait on the street. This doesn’t scratch the surface of the dining possibilities in the quartier. 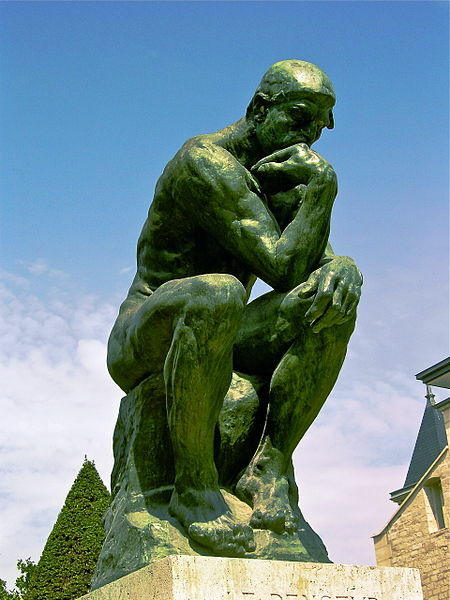 Rodin's The Thinker. We surmise he is pondering which 7th arrondissement restaurant to book for dinner. Don’t overlook the exquisite Musée Rodin located in his workshop, the Hôtel Biron (which once housed the Academy of the Sacred Heart, an ET alma mater). This compact museum features a delightful sculpture garden where you can contemplate “The Thinker” contemplating you. We would be remiss not to mention that ET hero-author Nancy Mitford entertained DeGaulle’s Chief of Staff at her home in the rue Monsieur. One day we’ll write up our pilgrimage to Nancy’s digs and my brush with literary greatness. We’re ecstatic that we’ll be returning to our haunts in the 7th next month. Watch for “as-it-happens” reports from our habitual table at La Terrasse du 7eme.